I often get asked, “Don’t you have to change yourself before you think about changing anyone else — or the church?” Yes, of course. But, on the other hand, we’ll never be good enough or ready — we have to rely on God to actually do the work of change in us and in others and in the church. So how do you know you are ready enough, transformed enough to be bold enough to take on the role of Change Agent? I think it comes from seeing that both individuals and church communities need to be ‘loved into’ changing by God. “First we receive love and then we can respond with love. Here we glimpse a glory and a beauty that not only calls us, but empowers us to a different way of life, to daily discipleship.” This quote is spoken by the noted theologian Hans Urs von Balthasar in an imaginary monologue created by Michael Paul Gallagher in his book Faith Maps. It summarizes the relationship between personal and church transformation that I am suggesting. Let me break it down for you. “First we receive love” Everything starts with God’s initiative. Even the fact that you are reading this is evidence that God has triggered some desire in you out of love. Probably the most quoted Bible verse in America, displayed at many public places and events, is “For God so loved the world that he gave his one and only Son, that whoever believes in him shall not perish but have eternal life.” [John 3:16] That, in a nutshell is what salvation means. God acted so that human beings can have eternal life. Salvation precedes everything and any human initiative. “then we can respond with love” Deep movements in ourselves continually pull us toward God. The Spirit prays for us when we cannot. God inspires and draws us forward. So, our first step in transformation is responding when we perceive these deep movements. Our response can be to change ourselves or help some neighbor or begin to transform our local church. The Spirit’s power is enabling all these responses. “that not only calls us but empowers us to a different way of life” When we see the reality of what the Spirit is doing in and through us, we experience the desire to do this again and again. This is our ‘call,’ to follow a different way of life, and take seriously our own unique role in Jesus’ mission, even before we know what that is. We begin to discover a different kind of inspiration and power in our life. “to daily discipleship” Finally, we want to follow Jesus, in the world but not solely of the world. We don’t know what this is, of course, and fall short often. Nonetheless, we strive to follow him. This striving, over time, perhaps many years, becomes a ‘24×7’ way of life. Actually, striving is the wrong word, because it is too connected with the common western culture. A better word is ‘floating’ in God’s Spirit. We learn to trust and float, as the Spirit carries us to the “good works , which God prepared in advance for us to do.” [Ephesians 2:10b] And we learn to trust that we will be up to doing these tasks, because it is God’s power in us, not our own self-development that is doing them. That is why salvation is the essential starting point for Christian transformation. These wonderful things happen to us both when we are alone and when we are in a community of Christians. In fact, for many people, the ordinary experiences in the church community are how they encounter salvation and the lure of discipleship. This being so, we now need to talk about how personal and church transformation are linked. 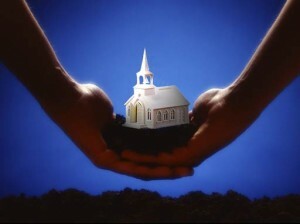 Is the church necessary? If a personal relationship with Jesus is the essence of salvation, why get involved with church and ‘organized religion’ at all? Primitive man believed that life depended on being part of a tribe; you couldn’t survive alone. After Pentecost, believers didn’t “join” a church or an organized religion, but they became part of a community of Christians. But now, the common culture stresses “individualism” and therefore joining a church seems to mean giving up something, some essential freedom. What I’m saying is that we are all profoundly shaped by the point of view of the common culture, including Christians, and can no longer see the church’s utter necessity as Jesus sees it. Otherwise why would so many Christians see church as optional, or at best something they “need” occasionally, on Sundays or at Easter and Christmas? I want to help you get outside the common culture and see your local church through Jesus’ eyes. Then you will be able to see how your own transformation is inextricably linked to your local church’s. I believe that the three points made by Peter in his first sermon can lead 21st century Christians to a fresh understanding of how Jesus sees church. Let me expand each point of Peter’s sermon, and relate them to personal transformation and church. What you have done. In a way, Jesus was establishing a ‘burning platform’ at the outset. To the crowds right after the Crucifixion, Peter said, “You are responsible for this. The Romans may have carried out the sentence but all of you are responsible.” Jesus is saying to us, today, “The human race is responsible for the wounds of the world and, because of that, I died. The Romans crucified me in the 1st century but you are responsible, even today, for the wounds that infect mankind.” I’m not preaching old-time fire and brimstone religion; I’m simply pointing out that in Jesus’ mind, what the human race continues to do is an extremely serious matter, which none of us can ignore, especially Christians who ostensibly know what’s going on in the last days. Who I am. The crowd responded when they understood who Jesus is. Peter (in Luke’s telling of the story) led them carefully from what they knew, from Scripture, to who Jesus is. Their recognition was instant; over 3,000 people who heard Peter speak accepted who Jesus was on the spot. We can be certain that recognizing who Jesus is a key part of church. Not that there aren’t debates. Many of these arise from how our culture conditions even Christian thinking. But despite the debates Christians encounter who Jesus is and the fundamental necessity of a relationship with him. What you ought to do. Here Luke uses the language of the early church to describe something that happened probably at least fifty years earlier. The story had been told over and over, but Luke’s purpose was to tell people who weren’t able to directly hear the story in his time and for all time, what they ought to do. “Repent and be baptized, every one of you, in the name of Jesus Christ, for the forgiveness of your sins. And you will receive the gift of the Holy Spirit.” [Acts 2:38] “Repent and be baptized” and “receive the gift of the Holy Spirit” were both phrases that developed as Christians considered what had happened in the first days after Pentecost. What these words do not mean is “Go, develop a private relationship with Jesus.” I think that they mean, “Realize something new has arrived in your life and come join the followers of Jesus.” The primary message is that the gift of the Spirit flows, at least in Christians, from accepting, perhaps tentatively at first, and finally fully at the level of conviction, that we are part of the Body of Christ. Church is essential to all Christians, not an add-on or crutch, as the modern culture sees it, for those who aren’t strong enough to stand on their own two feet. Church means being connected to the vine, being part of Jesus’ body, being part of God’s family. So how could any Christian possibly see the church as optional? Today, this happens because we are ‘swimming in a culture’ that has long since decided that life is for ‘rugged individualists’ and that being part of church detracts from our freedom. We accept that view because the church no longer presents a contrary view in any way that makes sense to us. That is another strong reason why local churches must be transformed. Local churches ought to begin considering how much they need to be transformed by examining themselves honestly, not by assuming all is well. Jesus gave us a good way to assess ourselves. “By their fruits you shall know them.” A spirit-filled church produces good fruit; one that isn’t spirit-filled produces no fruit or even bad fruit. Spirit-filled churches have spirit-filled people. So, an excellent first step is to ‘soul search’ about whether your church is spirit-filled or not. Let’s assume that you sense some gap and want to further consider transformation. This then raises a ‘chicken and egg’ question. To transform a local church must you initially transform its members to being spirit-filled, or do you transform a church so that it can help its members become spirit-filled? My answer is a “both-and” answer. However spirit-filled or wounded a local church may be, the members of that local church should begin the transformation process. By helping the church become a better follower and lover of Jesus, it will thereby be better at helping its members become more spirit-filled. And Spirit-filled people can help the church transform itself even more. This is a ‘virtuous circle,’ that starts in the hearts of its members. Next PostNext 10,000 gods versus one?